[by Shin Hyung jeong] As the barrier for celebrities from South Korea and China to act in each other’s country is destroyed, there are more active exchanges between the two countries. Accordingly, there are many cases where South Korean stars and Chinese stars are compared with each other, making a synergy effect for their popularity. In particular, fans in South Korea and China express their interest while feeling great fun in discovering similarities between South Korean stars and Chinese stars. Let’s analyze similar stars from South Korea and China, feeling the reality of a single stage of South Korea and China. Jang Na-ra and Zhao Li Ying have many similarities such as small and delicate features, cute atmosphere, and small body. As well, the harmony of their characteristics are familiar and popular, making them able to act lovely characters anyone cannot help loving. Another common thing between them is their cute feeling that is kept even if time passes by. The reason why Zhao Li Ying is considered familiar in South Korea and why Jang Na-ra is considered so in China is clear. Choo Ja-hyun and Zhang Tian Ai have a typical Chinese beauty face whose features are big. They also have a similar atmosphere to display a charm of a mature woman. Especially, people say they look more similar when they smile. Isn’t it possible to think that Choo Ja-hyun, who gained greater popularity in China than in South Korea, could do so thanks to her similarities to Chinese stars? Both stars, Choo Ja-hyun and Zhang Tian Ai, are also similar in the aspect of influence to respectively have over 2.11 million followers and over 3.72 million followers on Weibo. 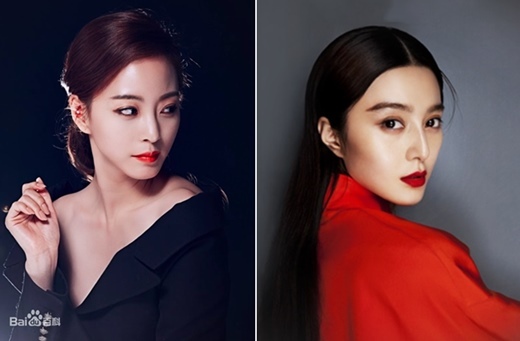 It is natural that Han Ye-seul, a representative cat-faced star in South Korea, and Fan Bingbing, a representative cat-faced star in China, are said to be similar to each other. They best realize the features that modern women want with their proud and chic image. Now, finding similar celebrities from South Korea and China is not limited to the entertainment scenes of the two countries. You can find similar ones among opinion leaders who objectively convey social realities and lead the public opinion in South Korea and China. Compared with each other are Yang Lan, who has an enormous impact as a female opinion leader in China with over 34 million followers on Weibo by ranking 27th in the Baidu ranking on anchors, and Kim Joo-ha, who lead the public opinion by covering all areas of the press in South Korea. The common thing between them is they keep confident attitude with an intellectual and reliable image. Maybe they can do so by managing themselves thoroughly.